Explore the Great Hall of Hogwarts with AESU! As of June 26, 2017, Harry Potter and the Sorcerer’s Stone is officially 20 years old! J.K Rowling’s first novel has been translated into 79 languages and has sold over more than 450 million copies worldwide. The story of a young wizard fulfilling his magical destiny with the help of his friends has provided entertainment, enjoyment, and hope for generations of people across the globe. This year, celebrate the legacy of Harry Potter with a Leavesden Studios day trip! In 2000, Harry Potter and the Sorcerer’s Stone began filming out of Leavesden Studios in Hertfordshire, England. Over the course of ten years, every one of the Harry Potter films would be based out of the studio grounds. Warner Bros. is the only Hollywood studio to own and operate a production facility in the UK. The Great Hall was one of the first sets to be built in Leavesden Studios. It could seat more than 400 actors, and subsequently became a key set in almost every Harry Potter film. It permanently resides at the Studio Tour for visitors to experience. 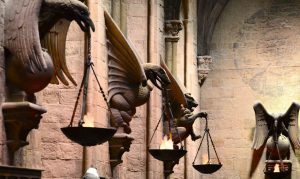 Explore Dumbledore’s office, built for Harry Potter and the Chamber of Secrets, to gaze upon the Sorting Hat, the Sword of Gryffindor, and Dumbledore’s desk. Stroll down Diagon Alley, take a peek in the many colorful shops, and measure yourself up with the triple-decker Knight Bus! EXPERIENCE HARRY POTTER WITH AESU! This entry was posted on Wednesday, June 21st, 2017	at 2:18 pm	. You can follow any responses to this entry through the RSS 2.0	feed. Both comments and pings are currently closed.